If you have seen those beautiful window paintings at holiday time and wondered how they were done, the answers you seek are right here! The Essential Window Painting Guide will walk you through everything you need to know. Can I paint windows that are tinted? How do I do lettering? You say you CAN'T draw??? In this guide, drawing steps are noted and illustrated for you. You will learn to draw AND you will learn to paint! Click on the "Buy Now" button and start the process. This tutorial helps you fulfill your desires for simple artwork. The most important steps you need to know about window painting are in this guide. You will learn all the beginning techniques from drawing out a simple design to its application on the window. Window painting can be a simple process once you see how the design is put together and in what order to work. Taking the time to practice these instructions will help you become an expert in no time. 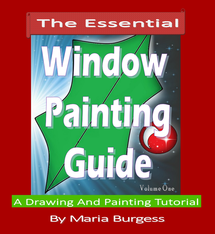 Read about how window painting artist and author, Maria Burgess got started and the best tips and secrets she has used for over 30 years. Create your own journey into the fascinating world of window painting! Sign the guestbook for future updates and special offers!